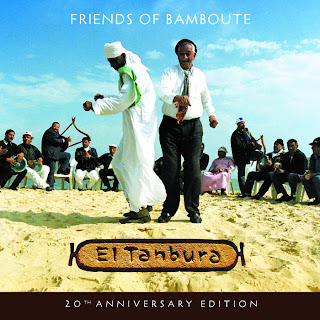 El Tanbura are a collective of veteran Egyptian master musicians, singers, fishermen and philosophers. 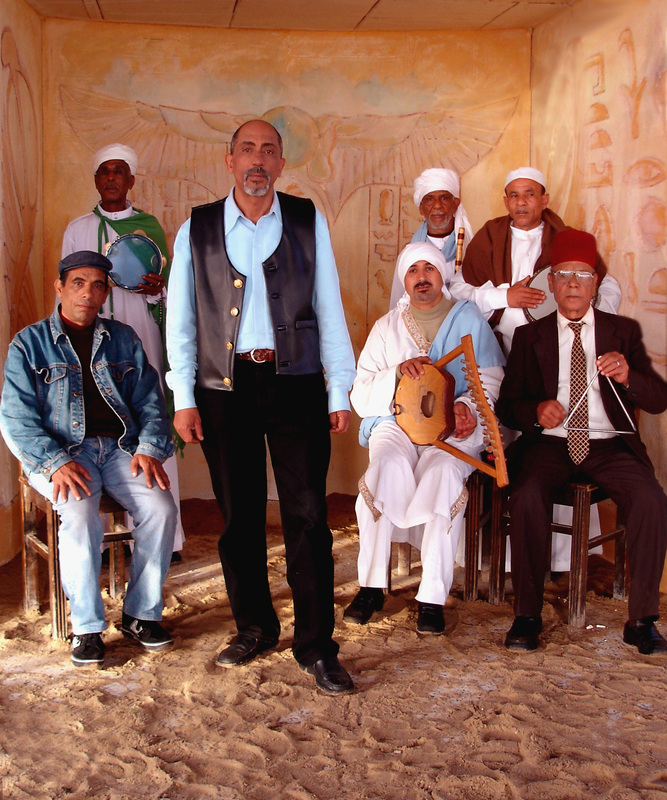 For the past seventeen years they've been custodians of some of Egypt's oldest folk melodies at their home in Port Said, the Mediterranean gateway to the Suez Canal. No one knows the exact origins of the Simsimiyya. One Egyptian legend tells how the first instrument was fashioned from the shell of an unfortunate turtle that had swum too far along the Nile and ended up as dinner for a hungry musician. Other stories say the Simsimiyya has existed for centuries in the Arabian Gulf, and her music (the lyre is always referred to as feminine and her players as lovers) has the ability to calm the waters of the Red Sea. Another folk tale attributes her origins to a mysterious enchanting Siren who slowly seduces both the lover and the audience with mesmerising melodies derived from ancient exorcism rituals. 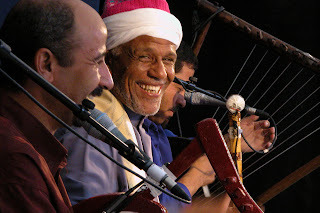 We do know that the instrument only arrived in Port Said during the 1930s; much to the frustration of the local Suhbagiyya (musicians) who had previously enjoyed the undivided attention of local audiences with Damma songs - a fusion of Sufi inspired vocal chants and frenzied drumming. It was only after the Suez Crisis of 1956 that Dama and Simsimiyya musicians embraced both repertoires. The War drew the former rivaling musicians together as the Simsimiyya provided a voice for the resistance movement through protest songs; a tradition that continued in the subsequent War of 1967 and exile of the people of Port Said during the Israeli occupation of Sinai. In exile, the diaspora communities would gather and sing the old songs reminding them of home. In the 1950s Zakaria Ibrahim, El Tanbura's founder, first heard the Suhbagiyya in Port Said as a young boy. The music he heard as a child haunted him all of his adult life and, on returning to Port Said in 1980, and seeing the desperate musical conditions, he spent nine years seeking out the old masters and building friendships, trying to convince the musicians to perform once again. And El Tanboura group was born. At first, news of the group's rehearsals drew scorn and ridicule from the commercial musicians; however the infectious atmosphere of the initial performances convinced others with an interest in Sufi philosophy and the pre-War traditions of Port Said to join the floating collective of El Tanbura's members. Over time, the band grew to include not only folk musicians and percussionists, but dancers and singers drawn from local fishermen, market traders and builders, alongside the unlikely addition of master instrumentalists from some of the State-approved music troupes who were desperate to perform with others who had a vibrancy of spirit and to play long-forgotten songs from antiquity - praising something other than the government approved subjects. This is great music. Sometimes sacred sometimes frolicking always pleasurable. 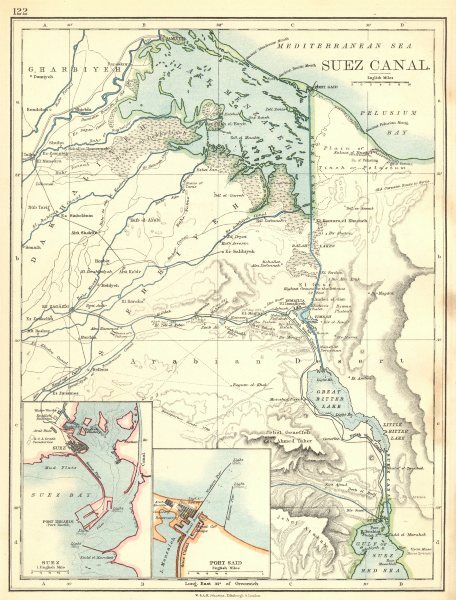 A real Suez Canal Social Club! Incredible synchronicity. Today, I was reminiscning on my recent stay in Egypt, delving into nostaliga, and listening to every El Tanbura song I could find on youtube. I was really regretting not buying any CD's when I was there. I thank you deeply for this! Tucker, That is great. How the universe works too. Enjoy the great sounds. What took you to Egypt? I was doing a semester abroad, living in an apartment in Cairo and studying Arabic. More synchronicity with the Tinariwen post! I am going to see them play on tuesday, and actually sent them an email to see if I could talk to them for a paper I am writing. keep the good stuff coming Nathan! A really great change of pace from the usual demand that cultures change to reflect the latest pop influences. Good to see that ridicule you mentioned fade before what these elderly caretakers of living music accomplished.